This website presents the results of a Transportation Studio class led by Professor Elizabeth Deakin at UC Berkeley in Fall 2014. Students engaged with two clients, the City of Oakland and BART, to evaluate impacts of two project proposals within the MacArthur Planned Development Area (PDA): a Transit Oriented Development (TOD) plan for MacArthur BART station and a Complete Streets plan for adjacent Telegraph Avenue. Analysis was conducted at multiple scales: the entire PDA, a half- mile radius of the BART station, and the Telegraph corridor. A mixed-methods approach of qualitative and quantitative analysis was used, with extensive original data collection. To conduct outreach with merchants and neighborhood residents, students developed relationships with the Temescal BID and the Longfellow Residents’ Association. Fieldwork included multi-modal traffic counts, sound meter readings, a parking inventory and occupancy survey, a resident travel survey, merchant interviews and a shopper intercept survey. Case studies were used to garner ideas and lessons learned, including a ‘lessons learned’ evaluation of Fruitvale BART. 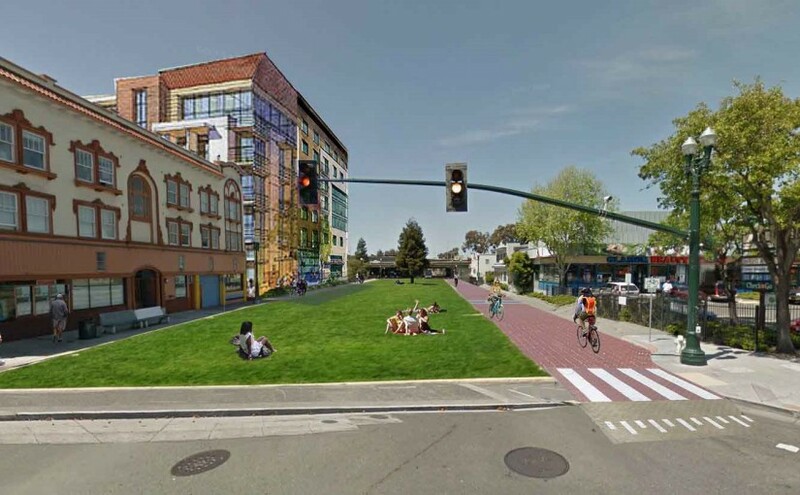 Design proposals included a new park, retail and transit mall at MacArthur BART, and redesign of four interstate underpasses bisecting the PDA. To gather origin/destination data for the corridor analysis, students developed an original ‘floating vehicle’ method to track individual car and bicycle movements. This data was used to calibrate a network model in VISSIM software estimating the traffic impacts of proposed new pedestrian and bicycle infrastructure. One student estimated a multinomial logit model to estimate the impact of Complete Streets infrastructure changes on citywide bicycle mode share – this is the first of its kind. The Final Report contains recommendations and design proposals that are creative yet grounded by input from clients, local residents, merchants and advocacy groups. Links to the Final Report, VISSIM model video, and design renderings for the freeway overpasses may be found in the links to the left. For more information, contact Sara Barz, sbarz [at] berkeley.edu or David Weinzimmer, dweinzimmer [at] berkeley.edu.